Nematode damage to corn can only be confirmed through analysis of soil and root samples. For most nematode species, their numbers increase during the first half of the growing season, but then decline later in the growing season. Consequently, soil and root samples should be collected in the middle of the growing season (mid-July) to determine if nematode numbers have reached or exceeded damage thresholds. One exception to this situation is the needle nematode, which moves down into the soil profile in the heat of summer and is more easily detected at greater numbers in samples collected in the spring and fall. But experiences in the Iowa State University Plant Disease Clinic over the past few years indicate that this nematode can be detected in soil and root samples collected in July and August. To check for possible nematode damage to corn, collect a soil core or small shovelful of soil from the upper 12 inches of the soil profile from the root zone of 10 or more plants within the area suspected of being damaged by the nematodes. Soil should be placed in a moisture-proof bag and submitted for processing as soon as possible. Be sure to keep the samples cool until they are sent for processing and avoid sending samples late in the week to prevent improper storage over the weekend. Soil samples for analysis of corn nematodes can be sent to private laboratories in Iowa and surrounding states or sent to the Iowa State University Plant Disease Clinic, 323 Bessey Hall, Iowa State University, Ames, IA 50011. 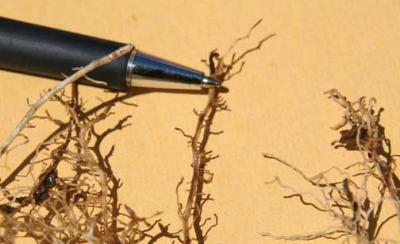 If samples are sent to ISU, the test for corn nematodes is called a complete nematode count. Samples should be accompanied by a completed Plant Nematode Sample Submission Form and a check made out to Iowa State University for the $15 per sample processing fee. 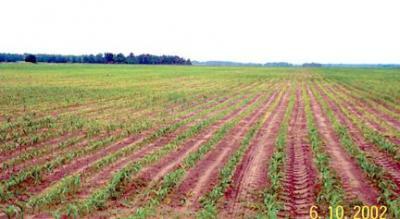 Young corn crop damaged by needle nematode. Photo courtesy of Tom Hillyer. This article originally appeared on page 131 of the IC-494(16) -- June 27, 2005 issue.